1. Move with us: Leave your photos and videos safely where they are. When ThisLife by Shutterfly reopens, your photos and videos will be one click away. Please note that your photos will be imported into the new service as high resolution JPEGs. 2. Get the originals now: Download all your photos and videos in their original formats now and then check out the new service when you receive the launch email. 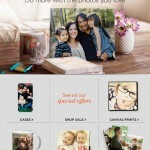 With one click, you'll be able to add all those photos and videos to the new ThisLife by Shutterfly. On the downside, face tags and stories aren’t making the leap to the new ThisLife by Shutterfly service. Things aren’t all bad, however. Current customers are being offered a year of the new service for free. This offer is available to anyone who has a ThisLife account as of today, Aug. 19. For more information on the transition, Shutterfly encourages folks to visit the ThisLife FAQ webpage. You can also email them at [email protected]. I really enjoyed ThisLife when it first launched in 2012 – so much so that I wrote about it and continue to use the service today. However, I haven’t exactly been happy seeing the development on the iOS app grind to a halt, and for so long. Hopefully, this is going to change very soon.